The idea of using music as torture goes back a long, long time, and we're not even talking about the piano recitals you used to force your parents to come to. According to The New Yorker, the first time we ever heard of pairing music with brutality or destruction was in the Bible, when trumpets blared at the walls of Jericho. The world has gotten a little more technologically advanced since then, and now interrogators can drive a person mad with the help of some headphones, speakers, and some songs. What songs? These songs. When it comes to misunderstood songs, Springsteen's "Born in the USA" is tops. Even President Ronald Reagan took it to be a patriotic little tune (via Billboard), and no one's gotten any the wiser in the 21st century. The fact it's a working man's anthem and a condemnation of the country's treatment of its citizens makes it pretty ironic it would be used by the government to torture detainees at Guantanamo Bay, but it's doubtful Shaker Aamer cared about that irony during his almost 14 years of captivity. NBC News says Aamer was held there after 9/11, and after the accusations went away and he was released, he's been pretty outspoken about what went on behind those closed doors. He said, "Guantanamo is built on how to destroy a human being totally, how to damage him mentally, physically, spiritually." And part of that was relentlessly playing "Born in the USA," over and over, especially during prayer times. Sleep deprivation is no laughing matter, and one way to make sure a person isn't getting any winks, much less forty, is to play incredibly jarring music at a deafening volume. One of the favorite songs of Guantanamo Bay interrogators was Drowning Pool's "Bodies," and this particular story takes a weird turn. 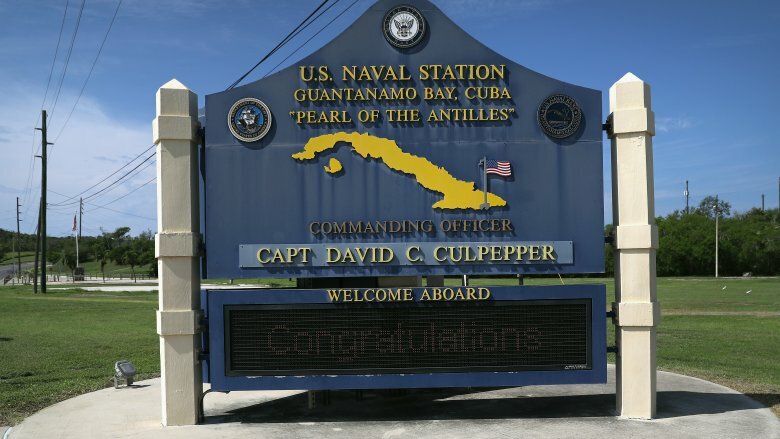 In 2017, Guantanamo Bay officials were busy booking entertainment for July 4. Yes, really. Among the scheduled acts was Drowning Pool, but even the name-redacted officials who were emailing back and forth thought this might not be the best idea. The emails — made public by the Freedom of Information Act — talked about how their live appearance at the base might be seen as being in poor taste, considering their song had been playing on a constant loop for 10 days while interrogators questioned Mohamedou Ould Slahi. Slahi, Splinter says, was ultimately released without being charged at the end of a 14-year stint in the facility. It's impossible to imagine the horrors of a World War II concentration camp. You've seen the pictures, sure, but did you know there was a soundtrack, too? In 1944, Primo Levy was sent to Auschwitz. According to The New Yorker, he was greeted by the cheery tune sometimes called "Rosamunde," sometimes called the beer barrel polka. It greeted the prisoners every time they returned to camp after a day's marching or hard labor, and it also played relentlessly as prisoners were killed at Majdanek. The Music and the Holocaust project looks at everything from the Nazis' musical propaganda to the exile of composers, and they say Dachau was the camp most notorious for using music as torture. A loudspeaker system was built with "donations" from Jewish prisoners, and once it was complete, it played a constant stream of patriotic tunes. Those who survived the camp said it was a relentless barrage of marches, speeches, and nationalist songs, piped into every corner of the camp that had speakers, which was literally every corner of the camp. The music served another purpose, too: It covered the screams of prisoners who were being tortured in more conventional ways. The 84-page leaked document detailed al-Qahtani's torture regimen, and it started at midnight. In order to keep him awake, a Christina Aguilera playlist was piped into the interrogation room. It may not have been a random choice, either. The New Yorker suggests Aguilera was used in the questioning of Islamist detainees perhaps because women singing were believed to be extra-offensive. In case you're not up on your Chilean history, here's a quick recap. In 1973, General Augusto Pinochet organized a successful military coup, ousted his rivals, and installed himself as ruler. That lasted for 17 years, and according to NPR, it was a reign characterized by torture and thousands of deaths. Pinochet died in 2006, and that's when research into the darkest corners of his regime started. The University of Manchester's Dr. Katia Chornik interviewed some of the people who were held and tortured during his rule (via History Extra), and found a popular tactic included days and days of torture via loud music. The songs are a bit odd, not what you might expect. George Harrison's "My Sweet Lord" was one of the most popular, along with Julio Iglesias's "Venceremos." One of the women Chornik spoke with said they played an Italian pop hit called "Gigi l'Amoroso" while they tortured her in other ways, and her captors would sing along — starting with when they came to get her out of her cell. The entire soundtrack to A Clockwork Orange was another favorite of Pinochet's torturers, which is both terrifying and a bit cliche. In 2003, the BBC revealed something that has the potential to ruin childhoods everywhere — and sanity for some. The USA's Psychological Operations Company had settled on some good old musical torture for getting information out of the prisoners being held in Iraq, and song choices weren't random. Some groups (like Metallica) were chosen because they were deemed "culturally offensive," while others were just downright annoying. Songs from Barney and Sesame Street were high on the repeat list, and when one U.S. operative talked to Newsweek, he claimed part of their training was listening to Barney's I Love You song for a 45-minute, continuous loop. He was quoted as saying, "I never want to have to go through that again." If you're horrified by that, you're not the only one. Al Jazeera talked to composer Christopher Cerf, who spent 40 years writing songs for Sesame Street. He was understandably heartbroken when he found out the songs he'd written to help kids were being used to torture adults. Irish boy band Westlife had a massive hit with 'My Love' way back in 2000. It wasn't until 2015 that a lawsuit filed by the American Civil Liberties Union mentioned the song, claiming CIA operatives included it in a torture program used in a COBALT prison in Afghanistan. Suleiman Abdullah (who was ultimately released from custody without being charged) said part of the torture he was subjected to involved being "assaulted with music" by Westlife. Why that song? Abdullah says his interrogators told him it was picked just for him, as he'd been nabbed by the CIA two weeks after his wedding. He never saw his wife again. Binyam Mohamed's story is a long one, and it starts with seeking asylum in the U.K. in 1994. According to The Guardian, he was later detained in Pakistan and was held in both Guantanamo Bay and a CIA prison in Morocco. Since his 2009 release, he's been at the center of a massive human right campaign (via The Telegraph), and has detailed some horrible torture methods, including beatings and being sliced with a scalpel. It was all against a backdrop of relentless music, including Eminem's "Slim Shady" and Dr. Dre on a seemingly infinite loop. Songs were played for days and days, and when The Guardian interviewed him in 2008 he said the music was worse than the physical pain. "Imagine you are given a choice," he told them. "Lose your sight or lose your mind." The Guardian tried to reach out to a number of artists in 2008 to see how they felt about their music being used to torture prisoners. Most wouldn't comment (or didn't return calls), but one who did speak out was Britain's David Gray. His song, "Babylon," was used in the torture of Haj Ali, looped and turned up so loud "he feared that his head would burst." Gray was shocked people weren't more outraged, saying, "The moral niceties of whether they're using my song or not are totally irrelevant. We are thinking below the level of the people we're supposed to oppose, and it goes against our entire history and everything we claim to represent. It's disgusting, really." In 2008, The Telegraph reported there were a handful of artists who were starting to protest the use of their songs in torture, led by David Gray. Joining him was Sesame Street composer Christopher Cerf and Rage Against the Machine's Tom Morello, but death-metal drummer Steve Asheim of Deicide definitely didn't have a problem with any of it. Deicide's 'F*ck Your God' was named as ranking pretty high on the favorites list for torture, and it's pretty obvious why. But The Guardian reported Asheim was down with it, even questioning whether torture by music was really torture. "These guys … are warriors, they're trained to resist torture. They're expecting to be burned with torches and beaten. … If I was a prisoner at Guantanamo Bay and they blasted a load of music at me, I'd be like, 'Is this all you got? Come on.'" He also said he doubted his song was chosen for any particular reason, in spite of the obvious possibility. Asheim says he's sure it's just because there's a lot of metal-heads in the military, and they like it. That's bad. 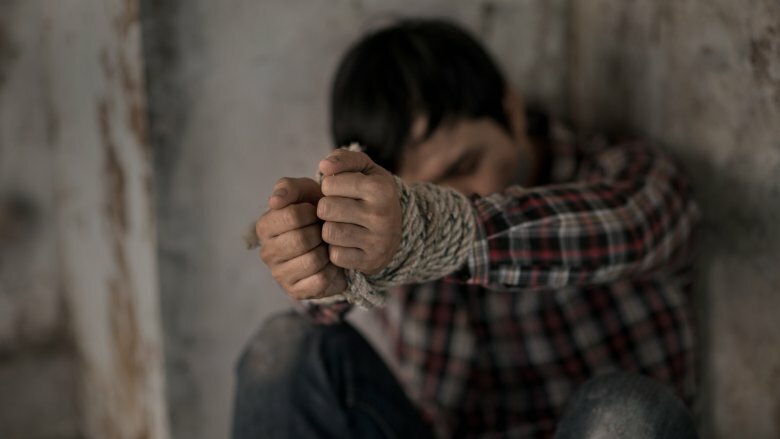 According to what he told Reprieve (via the Huffington Post), part of his torture was being handcuffed, outfitted with headphones, and having songs played over and over and over again. Songs varied only a bit, and he said he listened to hours of looped versions of Meat Loaf and Aerosmith, along with Tupac's 'All Eyez On Me.' He said it played for hours on end, all day and all night, through daylight, through sleep, through prayer time. After a couple days' break, it started all over again. Donald Vance was imprisoned in Baghdad's Camp Cropper. According to The New York Times, he was working as a security contractor when he reported his suspicions over illegal weapons trading. He was caught up in the sting and detained as a "threat." Vance kept detailed notes about what he went through, hiding them in a Bible and bringing them with him when he was finally released. The Guardian reported music torture was on that list, and a lot of it. Vance said the hard rock was almost constant. Along with a ton of Nine Inch Nails, there was one Queen song that played over and over again: "We Will Rock You." Since his release, Vance added that he likes his home to stay "very quiet." The Blues Brothers is an absolute classic, and it's hard to imagine anyone getting offended by it. But in 2014, the Senate Intelligence Committee made a CIA torture report public (but heavily redacted). There was a ton of horrible stuff in it, from waterboarding to sexual assault. And also the use of the Blues Brothers' version of "Rawhide." It was played (at least) during the interrogation of Ramzi bin al-Shibh, according to Vox, and bin al-Shibh was conditioned to know that when he heard the song start, interrogation was in his very near future. The official report says he "knows when he hears the music where he is going and what is going to happen." It wasn't just used to wear down a person mentally, it was used as a trigger to cue up a session of very bad things.